My friend Claude needed some help cutting some wood for an upcoming event at his house as well as his winter stash. So, he put a call out for a few of us from church to help out. He asked us to show up at 8:30 AM today and he'd have coffee, donuts and chainsaws. Now, I have to preface this post with the fact that I was raised a city boy. My house was deep in the middle of a pair of large cities, so I was not exposed to much in the way of country or farm living at all. That is why when I visit a farm or spend time at people's country homes I am like a little kid. Because I don't have much experience with a chainsaw, I stuck with the grunt work of hauling logs and stacking it. Claude has a couple of chainsaws and took the first shift cutting away. 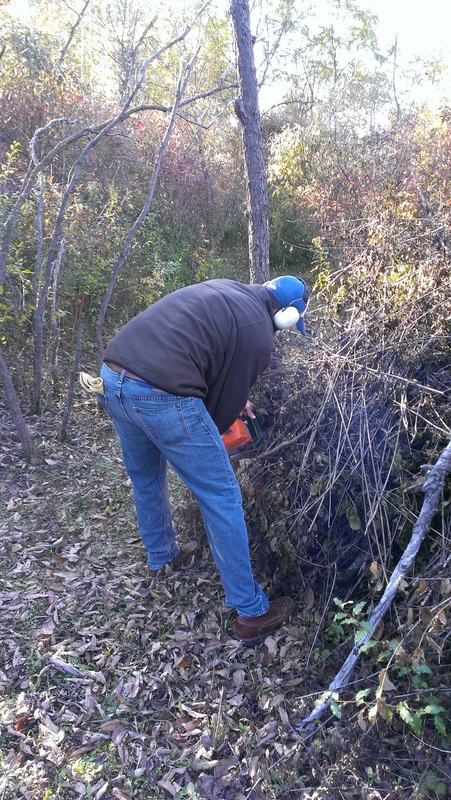 We all stood back and watched with our ear and eye protection while he cut through the big logs like butter with the Stihl saw. It was all two-stroke smoke and wood chips from there. We'd follow behind him and grab what he'd cut and put it in piles on the trail. From there, Eric would take it away using the lawn mower tractor and trailer. Eventually, Claude took the smaller saw and left Justin and I to take down a couple of big trees on our own. Justin took on what must have been a 60 foot tree and after a couple of minutes work, she fell with grace and elegance. I was joking with him that he should try and land it between a select two trees - kind of a split-the-uprights deal. Well, he was wide left as it turns out, but it was still a perfect landing. I was able to get most of it on video, for lack of a better job at the time. We worked like dogs for two hours. 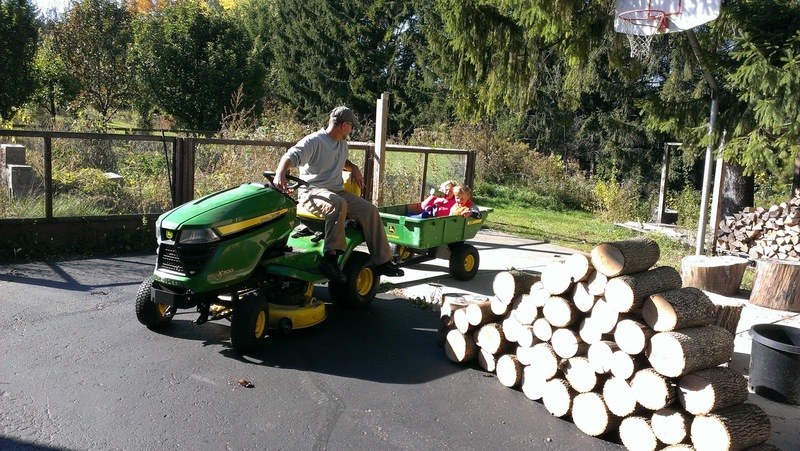 It was a perfect fall day with the temps warming nicely as we worked. What it was was a bunch of boys in boots and ball caps gettin' it done. It happens everyday on every farm in America, I'm sure of that. But to this city boy, the collaborative, outdoor, power tool, sweat and dirt, heavy-lifting guy thing is a rarity. One nice thing was that there were no slouches or slackers. Everyone came to work and realized that the sooner we reached our goal, the sooner we could go home. I want these guys on my side when the chips are down. Just focused, hard work fueled by donuts, pastries and coffee; that's all. And while I know Sunday is supposed to be a day of rest, this sure enough beat sitting reading the paper or punching buttons on a laptop.